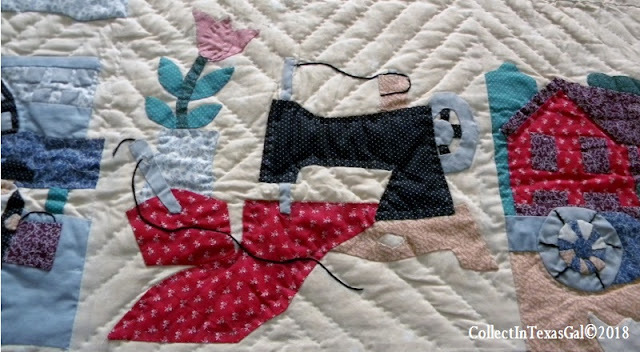 Always drawn to anything depicting a sewing machine, I fell in love with and bought this quilt many years ago. 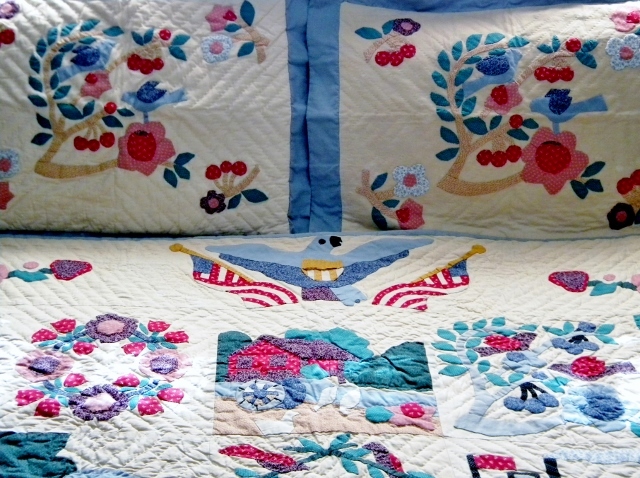 As one who sews pieces together on the machine and who also machine quilts, I knew I would never Applique or Hand Quilt a bed size quilt...much less in the primitive style. Not only does it have a sewing machine block, but also is a beloved 'Americana Themed Sampler'. A sampler is a collection of different blocks put together in one quilt. It's a favorite style of mine. 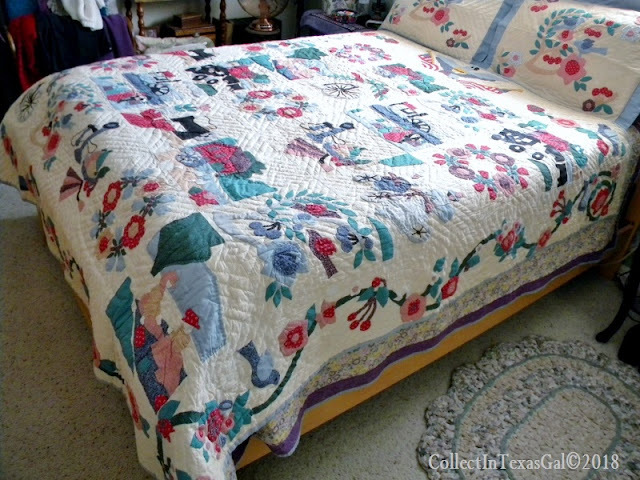 Now, why this quilt has come to light after several years of hanging in my quilt closet...it is time for it to move on to someone else who loves Americana, Samplers, Applique and Hand Quilted bedding. It now hangs on the '4Sale' quilt rack at Sue's MadeWith Fabric&Fiber Studio. In many ways and for the reasons I was drawn to this quilt to start with...parting is such sweet sorrow. However, in the realm of downsizing and working on my 4R's Bucket List...it's time for it to go. In case you are interested...it is Queen size with standard pillow Shams. As a primitive appliqued sampler, the applique is also what I would deem as primitive and the hand quilted stitching fits in the same category. I purchased it from a Quilt Shop that specialized in production quilts, therefore it is not 'One of a Kind'. It is in excellent condition having been lightly used and laundered only once. I'm selling it in my shop for $250...if interested...leave a comment. Since I am not now or ever have been what one would call an obsessive Hand Quilter...it is also time to purge Hand Quilting Thread and those Quilting Betweens. 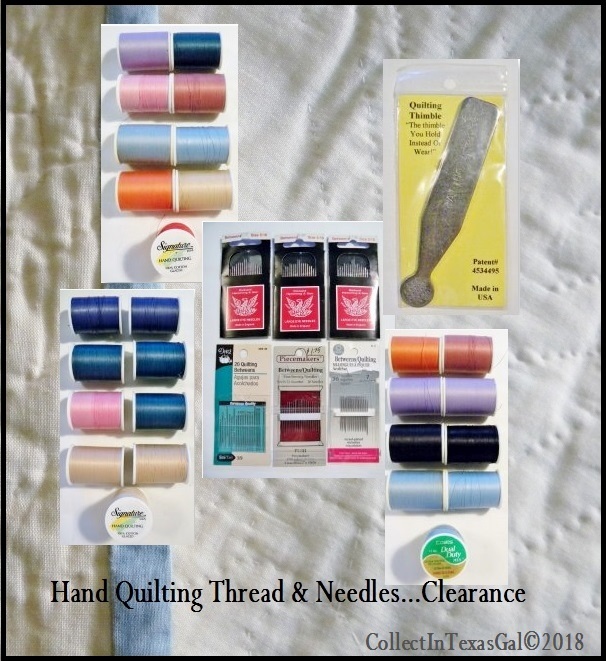 OMGoodness, they are not my favorite stitching needles with those tiny eyes. On the 4R's Bucket List they go.